NICK Holland, CEO of Gold Fields, anticipates more mergers and acquisitions will take place in the global gold industry this year and was not surprised by the tie-ups between Randgold Resources and Barrick Corporation, and Newmont Mining with Goldcorp. Responding to questions during the group’s full-year results presentation, in which headline earnings fell and net debt rose, Holland also said that mergers of large corporations did not necessarily bring the immediate benefits expected of them. “It’s interesting seeing the flurry of mergers and I think it will be active year, and that there will be more,” said Holland when asked about M&A in the market. “There’s a dearth of new discoveries, projects are not being built, production profiles are in decline, and this is against a backdrop of capital having dried up. So we’re not surprised it’s heading there. We saw this coming,” he said. It was for this reason that Gold Fields decided to run cash negative for a two-year period, of which the 2018 financial year was the second year, whilst the company invested in new projects. Gold Fields said last week it had spent total capital of $502m in two years mainly on its Damang and Gruyere projects in Ghana and Australia respectively. Gold Fields was now “on track” to produce two million ounces of gold a year for the next 10 years as a result of that investment. “We said [to ourselves] what we must do is prepare for the future. So we took a decision to run cash negative for two years so that we would have a growth pipeline of 10 years at two million oz or more depending on Salares Norte [the firm’s Chile prospect]. “We don’t feel compelled to do anything,” he said of Gold Fields participating in merger and acquisition activity. 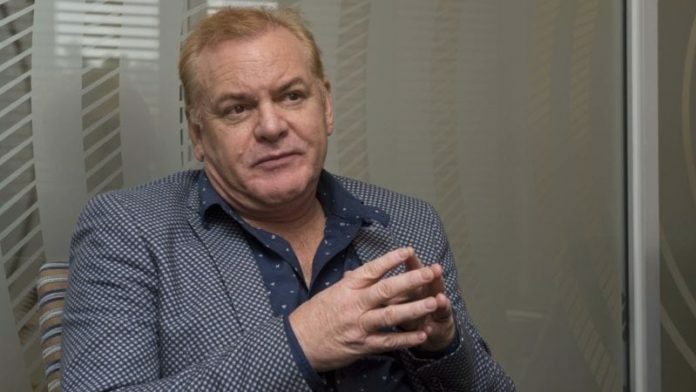 It was reported earlier this year that Gold Fields was in talks to merge with AngloGold Ashanti – speculation Holland dismissed. In addition to the spending capital on Damang (which is a brownfield expansions project) and Gruyere, the capital cost of which now stands at A$621m compared to A$532m previously, Gold Fields also spent $202m buying a 45% stake in Asanko Gold Mines (AGM) in Ghana, and helped to recapitalise AGM’s parent company, Toronto-listed Asanko Gold. Holland said the future of AGM lay in its Esaase project. “We didn’t buy Asanko for its $1,150/oz cost, but the ability to get to $950/oz. By the third quarter we will be able to give you something more concrete,” he said of the firm’s prospects. Returning to the phenomenon of large scale industry mergers, Holland said the benefits of corporate activity were often not immediate. Referring to the creation of Gold Fields, which was born out of the merger of Gencor with Gold Fields of South Africa in 1998, Holland said: “When Gold Fields was created, it took us two to five years to bed down a new culture.” Holland was the first CFO of Gold Fields. “In these new companies how many mines have they got?” he said of the deal complexity of the mergers. He added that the newly merged entities might not get the value they expected from selling assets that were deemed non-core as the mines would “not be the best”, and they would carry significant reclamation liabilities requiring capital spend.